Everybody who has been in Madrid for more than a year and has therefore lived to see the traditional Christmas market on Plaza Mayor before will agree with me that it is, by far, the most bizarre and inappropriate seasonal market ever anywhere. And that is because Spain nurtures some pretty bizarre and inappropriate traditions this time of the year. Hence the nativity figures and brightly colored wigs and masks. It is supposed to be no offence whatsoever to the catholic church, nor to the famous people involved, nor to the tradition of putting a nativity under your Christmas tree and yet an unsettling feeling will creep up once you study the figures on offer on Plaza Mayor to complement your set of Joseph-and-Mary-and-baby-Jesus-in-a-crib. Because, errr, are those little traditional Catalan-dressed farmers actually squatting with their pants down and producing a poo? Yes, they are. Most of them are even reading a newspaper or smoking a pipe while doing their deed, to pass the time in a more comfortable way. 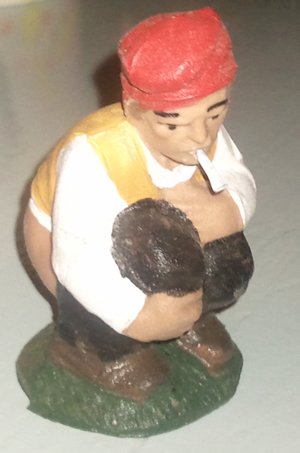 If you want to buy one ask for a Caganer, or Cagon (a crapper, basically). And they are not just farmer-figures (all though as far as I know those are the only ones for sale on the market), but can also be shaped looking like, say, Bush, or Queen Sofia. Or Aznar. Or Buddha. Or virtually every football player ever born, for that matter. Your newly acquired crib member could represent fertility of the earth for the new year. Or it could just make fun of Bush, the Queen and anybody else who can be caught with his pants down or her skirt up. Cataluna swears that a caganer should be seen as an honor and a homage to the person depicted and I suspect this must have something to do with catalan humor. Others say it is a reminder of the fact that each and every one of us has the same basic needs after all. Whatever the real reason for putting a farmer in need in your house, I bet that from now on you will not be able to pass a Belén (nativity scene) without looking for uncovered buttocks and a small heap hidden in bushes. That leaves the wigs and masks and they make up for more than half of the total offer for sale.. Only if you are aware that Christmas lasts two weeks (yes, two weeks. That is why it is called Navidades in Spanish, in plural. It just never ends. )–from December 24 to January 6- and that it therefore includes the 28th of December, you might understand why wigs and masks are considered to be a seasonal accessory. The 28th is the Día de los Santos Inocentes (Massacre of the Innocents) or the day that King Herod ordered the killing of every male baby in Bethlehem after learning from the Three Kings that one of them would remove him from his throne. Somehow, the Spanish, who used to be so devout and catholic, have managed to turn this day into a slightly overdue April Fools’ Day: a time for practical jokes that can go unpunished because the pranksters are ‘innocent’, just like those babes. It is a good day to mistrust every article or story that appears in the media –a republican newspaper spreading rumors that the King is about to abdicate, reports of hundreds of ostriches invading a village because the truck that carried them broke down- , and mistrust everybody else while you are at it. Spanish with less talent for more subtle jokes buy a wig or a mask. Works just as well. Last year the Ayuntamiento suffered an attack of prudishness and has banned the stalls from the very Plaza Mayor in order to keep the Christmas spirit a bit more decent, but just follow the Elvis look-la-likes and the men with big pink hair and you’ll find the stalls easily. This entry was posted in Culture, Shopping and tagged caganer, christmas market, plaza mayor. Bookmark the permalink.